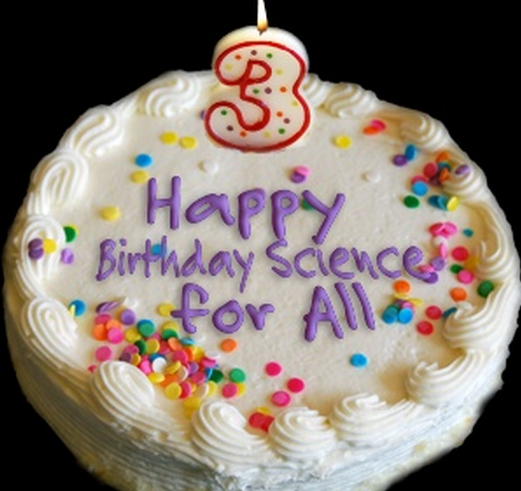 Happy Birthday Science for All! I published the first Science for All blog post on July 10, 2009. My only goal at the time was to give blogging a whirl and to see how it worked for sharing resources and information in my region of Washington state. In these three years I have created 671 posts related to K-12 science education and have hopefully provided a useful free resource to educators. Coincidentally, Science for All should also pass 200,000 views around the time this is posted (at 199,797 as I’m writing). That’s not a huge number compared to other blogs… but enough to keep me engaged and interested in maintaining this resource. I’m hoping to get back in a more consistent blogging mode in this 4th year (the 2011/12 school year really drained my blogging energy). Enjoy … and thanks so much for taking the time to check in over the years.